The palm-filled natural light Conservatory adjoins the Grand Ballroom and is adjacent to the English Garden and courtyard. Everyone will now enjoy this room’s lovely aesthetic…beautiful for brides, fun for cocktails and dancing, lovely and intimate for special dinners and celebrations, practical and comfortable for board meetings and conferences. This stunning room will make every occasion truly memorable. Behind a beautiful French tapestry a special amenity is present– a new high definition plasma T.V. This will allow you to provide personalized photo CD’s, DVD’s or power point presentations to enhance your guest experience. The courtyard's garden, complete with sundial and fountain, boasts a collection of old-fashioned roses, hollyhocks, foxgloves, columbines, dahlias and dephiniums surrounding a wrought-iron gazebo. The garden is perfect for late spring, summer and early fall events. The Palm Room is now a private dining room as well as a break out room and seats up to 35 guests. This charming, intimate room has been redesigned with an easy elegance that compliments the hotel. Gracious palms, a gold gilt Italian console and mirror with vintage sconces create an inviting room with elegant lighting and music. A complimentary continental breakfast is also served daily on the mezzanine. Original Lloyd Loom furniture has been chosen and ceiling fans capture the setting of a Noel Coward play. The Grand Ballroom, adjoining a palm-filled natural light Conservatory and adjacent English Garden and courtyard, is an ideal location for celebrations, weddings and private and business functions. The romantic elegance of the ballroom space is enhanced by an exotic axminster carpet in a flower and bird motif, botanicals hand-painted on the wall above a trellised wainscot, all of which are cast in the golden glow of the hotel's original mica and cast bronze chandeliers. Special Features: Larks restaurant, complimentary breakfast, business center, free wireless Internet, Waterstone spa, pet friendly, wheelchair accessible. 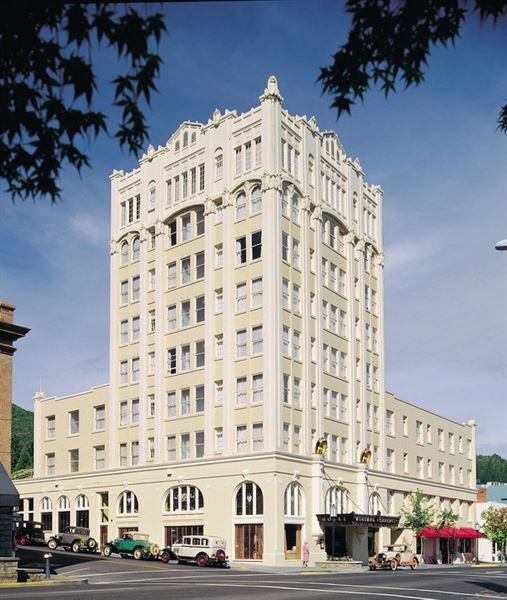 Ashland Springs Hotel menus feature fresh, local ingredients and pair sumptuous entrees with great Oregon wines.